Congratulations to the England Rugby Team on their recent ‘Grand Slam’ victory. 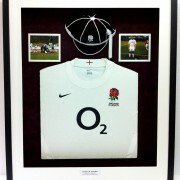 If you have any Rugby Memorabilia relating to the event, why not get it framed up? It might be tickets, programmes, shirts or photos. 0208 390 0205 or 01225 582060 for a FREE quotation. Still stressing over the perfect Birthday or Christmas gift? 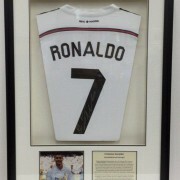 We recently framed up a Ronaldo signed shirt for a client’s husband. If you have any sports memorabilia that would be the perfect gift, once framed, please contact us here at Artwork Creations. We specialise in 3d objects and love a challenge! We are excited to launch our new website. 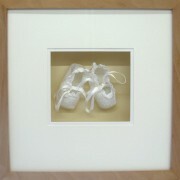 We will be updating you with all our news and sharing with you some of our more interesting framing challenges. 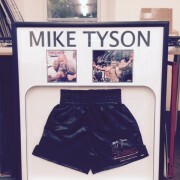 We have been busy with framing up sporting memorabilia over the last few weeks and using our creative flair to frame up anything from a World Cup Rugby shirt to Mike Tyson’s shorts!